Cub Scout Pack 39 of Smith Elementary raced its Pinewood Derby cars on St. Patrick’s Day at the elementary school, 355 N. Liberty St., Delaware. 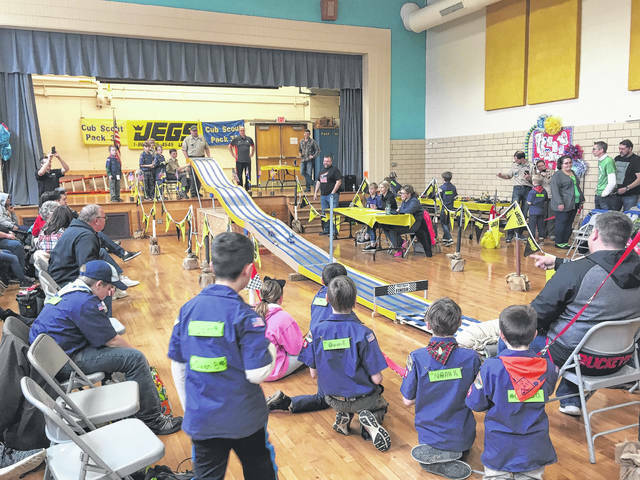 Thirty scouts from grades K-4, along with seven siblings, each participated in at least eight races before the competition moved into the semifinals. Scouts also competed for Best in Show. Car decorations were as eclectic as Hershey Bars, Swiss cheese, King Tut’s sarcophagus, Lightning McQueen and a Star Destroyer. This year marks two important milestones for the Pack. They include celebrating its 75th anniversary, and its transition to include girls starting this fall. The Smith PTO unanimously voted to make Pack 39 a family pack, which includes both girls and boys. The first girl has already confirmed she will join in the fall. The Pack has a history of encouraging family participation in events, but now girls will be able to earn awards and advancement right along with the boys. At the Pinewood Derby, scouts had fun and learned important lessons in good sportsmanship. To add to the fun, at intermission in the race, the Cub Scouts celebrated St. Patrick’s Day by decorating the Pack leaders’ faces with leprechaun shaving cream beards dotted with cheese puffs. Boy Scout troops 61 and 318 volunteered with the opening flag ceremony, food, entertaining the younger scouts between races, and assisting with running the races themselves. Pack leaders stated events like the Pinewood Derby wouldn’t be possible without the efforts of the local Boy Scouts and the numerous adult volunteers who lend a hand every year. For more information about the transition program taking place nationwide, search “family scouting” on the scouting.org or cubscouts.org websites. Pack 39 is part of the Simon Kenton Council. More information can be found about the local council’s transition at skcscouts.org.